WARNING: This product can expose you to chemicals including Titanium dioxide (airborne, unbound particles of respirable size), which is known to the State of California to cause cancer, and Lead, which is known to cause birth defects or other reproductive harm. For more information go to www.P65Warnings.ca.gov. "Swiss Army knife" direct box for multimedia integration. 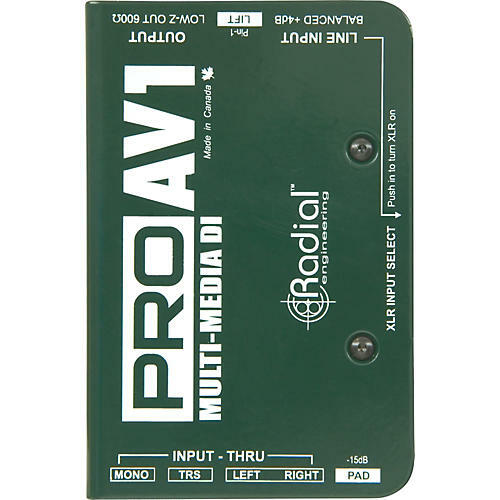 The Radial ProAV1 is a passive direct box specifically developed with the audio-video integrator in mind. The ProAV1 features a variety of stereo inputs that are merged via a resistive mixer to mono, greatly simplifying signal management. To eliminate the need for various adapters, a "Swiss Army" array of connections are provided, including 1/4" for instruments, RCA and 1/8" connectors for consumer electronics and computers, and a +4dB XLR input(s) for professional systems. Front panel connectors can also be used as thru-puts to allow multiple patch points. Custom-wound transformers are employed that are able to withstand exceptionally hot levels while maintaining linearity from 20Hz to 18.5kHz. The resulting smooth Bessel curve is warm and natural, making the AV1 particularly adept at handling digital sources that can sound harsh. Transformer isolation adds the benefit of eliminating ground loops that cause audio hum and buzz and video hum bars or snow. The ProAV1 direct box is ideal for events that interlace audio with video where music sources can include iPods, CD players, and video decks. The Radial ProAV1 will be a welcome addition to the AV technician's tool box. Plug your audio-video device into the ProAV1 using any number of connection options from XLR to 1/8" mini connector. L & R Stereo inputs are paralleled to the unused L & R input connectors so you can use these as thru-puts to connect to other devices or destinations. Stereo inputs are summed to mono at the XLR output. See the user manual for complete details about all the connection possibilities. A -15dB pad is provided to tame hot signals and the ground lift eliminates hum and buzz caused by ground loops. If you can only plug into one channel, or your mixer is set for mono output, just using a single mono cable or one side of the Y cable won't work. You'll lose half of your stereo mix. If you want to run mono (especially for long distances), the Radial ProAV1 will sum the stereo outputs to balanced mono and provide transformer isolation to protect your equipment from phantom power traveling back to the unit (causing it to burn out). Never, we repeat, never try to combine two signals into one with a Y cable or use a single mono cable. Here's why: Outputs are low-impedance and always must be connected to a high-impedance input. If you tie the two outputs together (with a Y cable or mono cable), each output will try to drive the other, which can force them beyond the safe current limit and possibly into short circuit. At minimum, you will experience a severe loss of signal. Worst case; you can damage your iPod or laptop. To avoid this, a resistive mixer is required-such as that found in the Radial Engineering ProAV1. Remember, a Y cable that splits one signal into two is okay (stereo to 2 x mono). Combining two signals into one is right out!